The day finally came. On Wednesday 4th December, after over 20 years of sitting above the arcade’s Vicar Lane entrance but sadly not working, visitors to Wednesday’s launch event finally saw the wooden Knight characters strike the quarters as the famous clock chimed again! It was the completion of the first phase of the restoration project of the 105-year-animated old clock. The clock first chimed in 1898 and was installed by the famous Wm Potts & Sons of Leeds, but had fell into disrepair in recent years. Earlier this year a campaign was started by the Grand Arcade retailers to restore the clock, which the owners ATC Estates have supported with significant investment. The clock brings a whole new opportunity to bring families back to here that have probably never seen this arcade. After months of fundraising efforts started by the residents themselves in August, with contributions from local supporters, shoppers and the landlords, enough money was raised to restore the clock as £10,000 was spent to restore the mechanics of the clock so it could work again. The full restoration is not yet complete, with another £15,000 still to be raised to have the clock fully restored and repainted, however on Wednesday we saw the clock back in action as the Lord Mayor of Leeds, Councillor Tom Murray unveiled the restored clock to it’s former glory! Dozens of people turned out to see the Knights strike the quarters in their procession of five figures who come out from behind the clock and then return to their quarters, and the cockerel flap its wings. We had a fantastic response from shoppers and our retailers at seeing the clock unveiling. 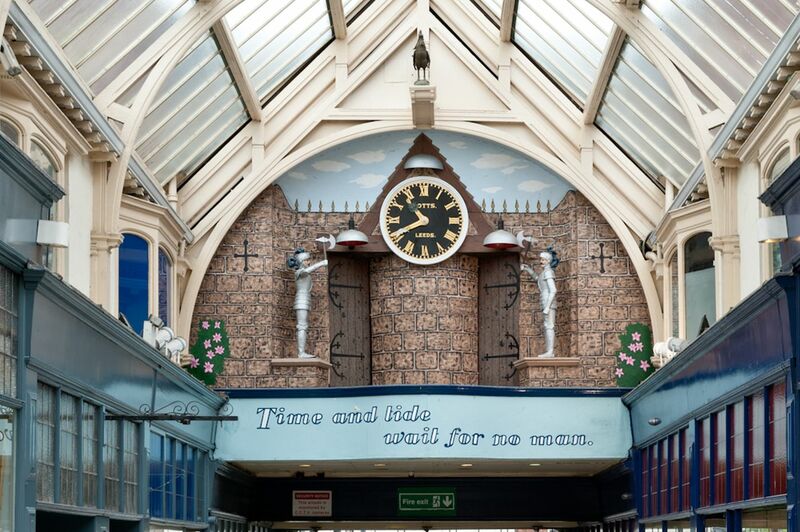 Many of the visitors recalled memories of seeing the clock chime during their childhood, bringing back some nostalgic memories of their time in the Grand Arcade. The clock brings a whole new opportunity to bring families back to here that have probably never seen this arcade. We reached our first target of the campaign by restoring the clock to working condition, however we’ve still got a long way to go to complete the restoration and reach our £25,000 fundraising target. We want to complete the project and fully restore this piece of history in our city. The basic mechanical work has been completed however this can only be continued for a certain amount of time. We need to raise more money so the work can continue to restore the clock and keep it working for a long time to come.